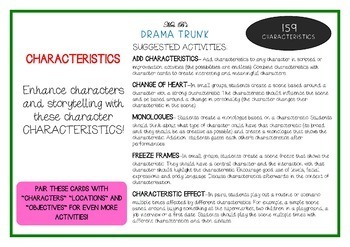 This set of 159 CHARACTERISTICS Drama Cards comes with suggested drama activities (Change of Heart; Monologues; Freeze Frames; Characteristic Effect) but can be used in so many more ways. 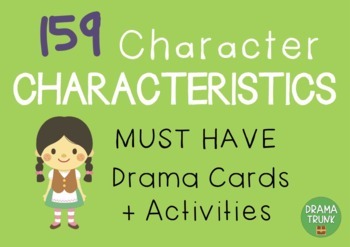 Add characteristics to any scripted or improvised character and create interesting and meaningful characters with these characteristic cards! Please note that this product is for personal classroom teaching or home school use by a single purchaser only. 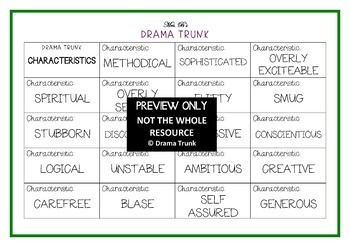 You may not distribute, copy or modify the drama cards other than for your own personal, non-commercial classroom use. 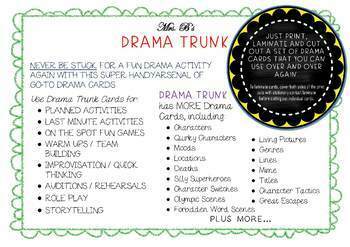 © Drama Trunk. All rights reserved.